I’ve never been to Hawaii, but I feel lucky to have had a few little tastes of it. My dad went there for the first time a few years ago and returned with vivid stories of roadside coffee sellers, mango-filled trees, and the spirit of relaxation lingering in the island air. When he returned to Hawaii last November, he came back to California with a suitcase full of generous holiday gifts, including an array of pure macadamia oil just for me. Preheat oven to 350 F. Toast macadamias on a cookie sheet for 7-10 minutes, until they are fragrant and start to become golden brown.Remove nuts from oven; let cool to warm room temperature. Meanwhile grease sides and bottom of an 8” round cake pan, then line bottom of pan with parchment and lightly grease the parchment. Put a ring of the toasted whole macadamias around the inner edge of the pan. 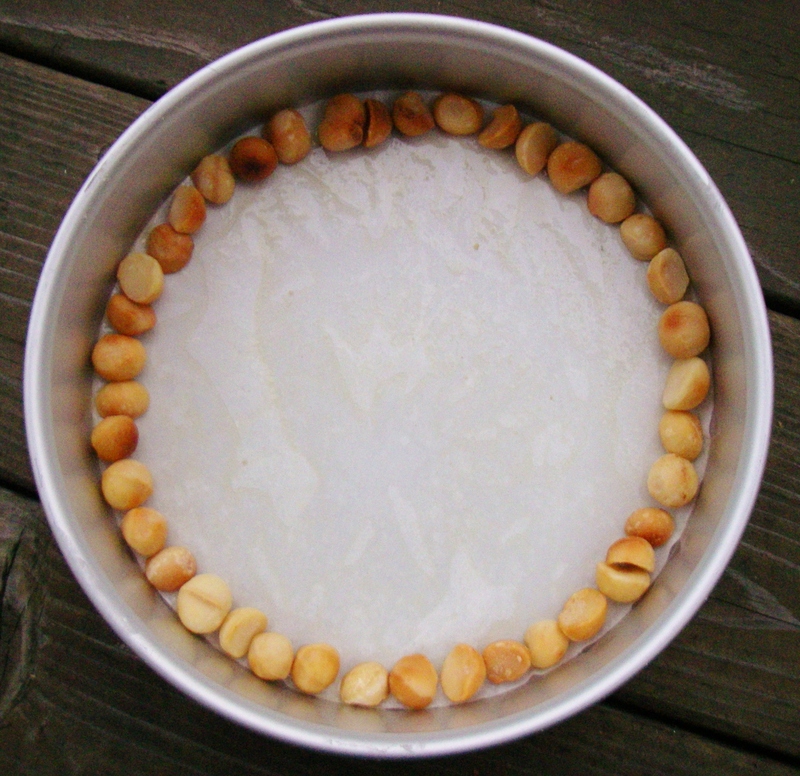 (The ring of whole nuts is not essential, and you will use about ½ cup fewer macadamias if you skip it. However, this step creates a toothsome surprise at the end of each cake slice. Several of my taste-testers, a.k.a. co-workers, commented that they were pleased to find their very own whole macadamia in their last bite of cake!) 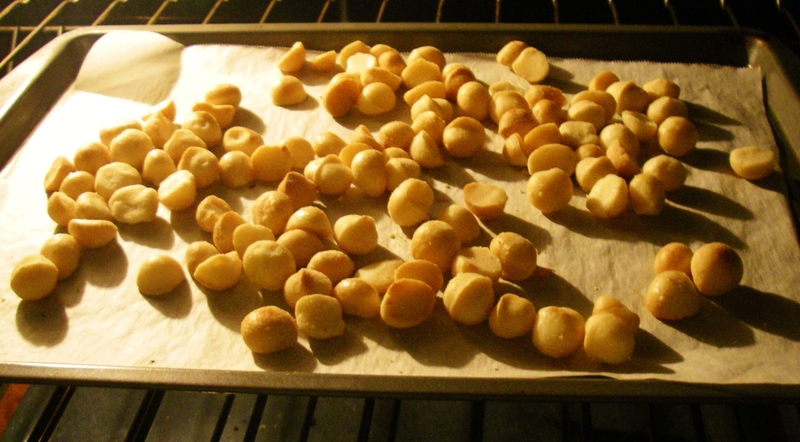 Coarsely chop remaining macadamias to make ¾ cup crushed nuts; set aside. Make the batter. (Be sure to stop the mixer and scrape down the sides of the bowl with a spatula periodically during this step.) Mix oil, eggs, sugar, and vanilla at medium speed for 3-4 minutes. Turn off mixer and sift flour (and salt, if using unsalted nuts) over the oil mixture, then gently mix until incorporated. With mixer on low, stream in the buttermilk. In a separate cup, quickly whisk together the baking soda and vinegar, then add to batter with mixer on low. Fold in the crushed nuts until just incorporated. Pour batter into center of cake pan, attempting not to m ove the ring of whole nuts. Bake for 50-60 minutes, until a toothpick or wooden skewer inserted in center comes out clean. The edges of the cake will be browned and toasty. Remove cake from oven and let it cool in pan for about 45 minutes, then remove and place on a plate or wire rack. (Leaving it in the pan too long can cause condensation at the bottom of the cake; taking it out too soon can lead to breakage). 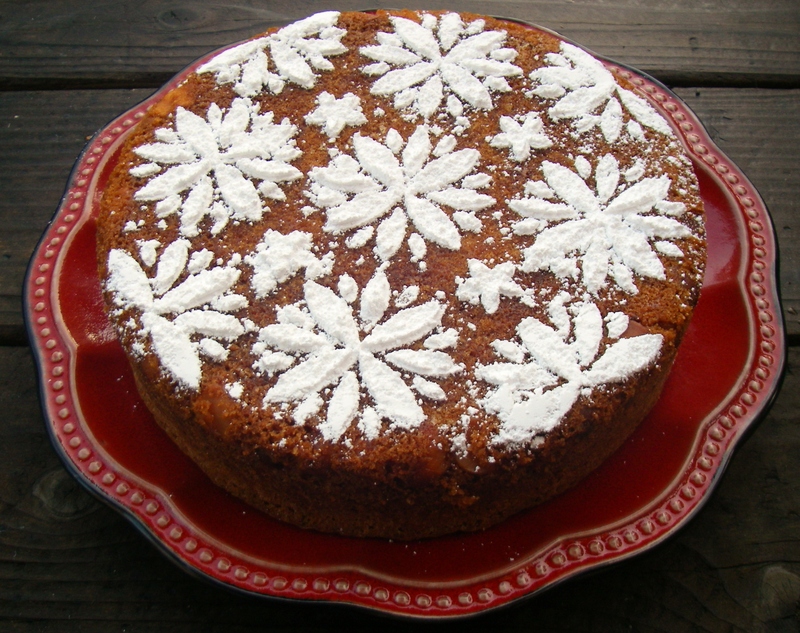 If desired, dust or decorate with powdered sugar once cake is completely cool. 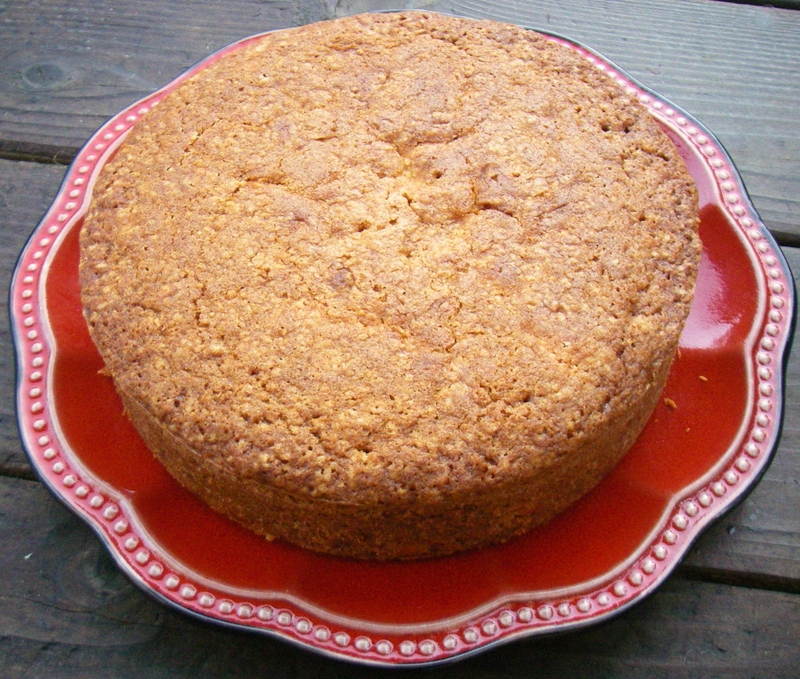 Store cake at room temperature for up to 3 days; do not refrigerate. 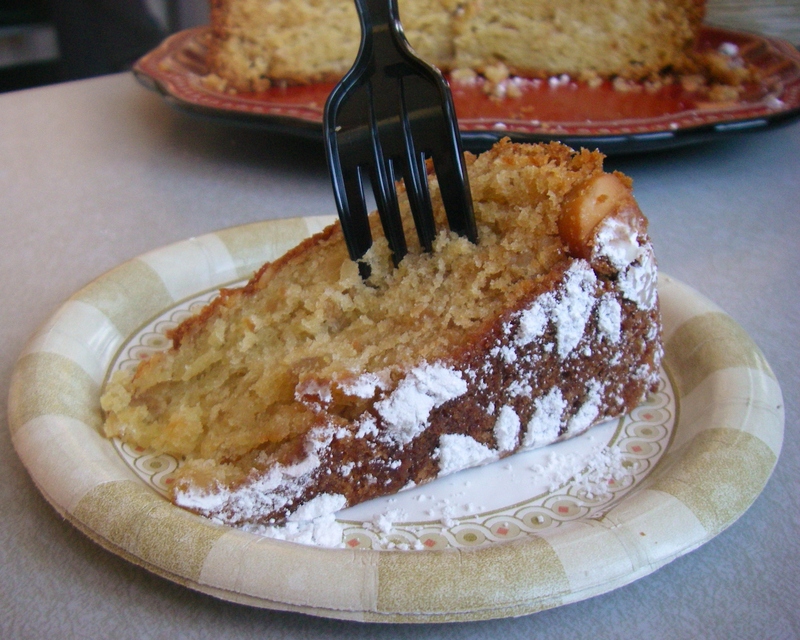 Nutty, decadent and very moist, this macadamia cake pairs quite well with a good cup of coffee (like, say, Kona?). A grass skirt, a fresh flower lei, and some background ukulele music are all optional. Maybe next time… The uncommon, rich flavor of macadamias is wonderful on its own, and I would hate to overpower it with anything too strong, but welcome additions to the recipe might be a pinch of ground cloves or cardamom, a scoop of shredded coconut, or maybe a drizzle of maple syrup atop a slice. I can also imagine it baked in a square pan and cut into bars; if you do so, be sure to adjust the baking time accordingly. This entry was posted in Cakes & Cupcakes, Sweets, Traditional with a Twist and tagged buttermilk, cake, hawaii, island, luau, macadamia, macadamia nuts, macadamia oil, nut, nut cake, nutty, recipe, tropical, tropical cake, tropics, vacation. Bookmark the permalink. Thank you, Cameron! The compliments mean a lot coming from such a creative lady. I’m also excited about your blog and keeping in touch — and about the 2nd honeymoon; in fact, I say honeymoons should be unlimited! ooh, this sounds yummy and the pictures are great. I’m making it with the ring of whole macadamia nuts. Thanks, Itzak — Let me know how you like it!